As I type this, I am listening to “Monster Mash” by Bobby Pickett, “The zombies were having fun, the party had just begun…” Listen and watch here. Anyhoo, since we are getting close to Halloween, how about some craft and food links for Halloween fun? I have always wanted to have a Halloween fancy-dress party. But I don’t know enough people who would be interested. Boo! But I think I will make some decorations and themed foods regardless. The Kitty Litter Cake has been on my must make (and must gross people out) list for a long time. Is this the year I make it? I think so! Muhahaha! I’ll just have to make sure my Max Kitty doesn’t think it really is a tray! The ghosty cupcake at the top is one of the Halloween foods I have made in the past. That year I made dark chocolate cupcakes and used food gels to draw spiders on some, and placed white marshmallows on the rest. I shaped each marshmallow by pulling a little of the top part up, and then twisting it to look ghost-like. I then made a mouth with a toothpick, then decorated with gels and icing. 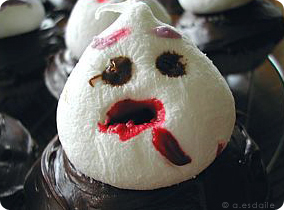 Ghost Mallow; not all that scary but very cute and tasty! The poor StayPuft Marshmallow man!! He looks like he’s been putting his make-up on in the mirror in the car on the way to work.